This analysis is an abridged version of a report which the Author prepared for the International Egg Commission (IEC) in London, UK. In the first part of this article it was analysed how the housing systems developed from small flocks kept on farms via first market-oriented production systems to battery cages in the 1960s. It was also described the development and dissemination of alternative housing systems not only in Europe but also in other parts of the world. Then, the existing housing systems were classified and characterised in detail, distinguishing between conventional cages, furnished cages, barn systems with and without outdoor access. This second part of the report will deal with the advantages and disadvantages of the housing systems under animal welfare aspects. This will help to better understand why it will be impossible to develop housing systems which on the one hand meet all demands of animal welfare initiatives and at the same time reduce the disease risk and allow a profitable egg production not only in post-industrial societies but also in developing countries. The final part of the analysis will give an overview on the present situation of housing systems in the EU and global egg production. Poultry (Layer) Code of Practice Scientific Committee: Review of scientific research on priority issues (2013). Parallel to the intensification of laying hen husbandry and egg production in the 1960s, especially the use of cage batteries, the protests of scientists, animal welfare groups and political parties against this form of keeping farm animals began in Europe and later spread to Northern America. Ruth Harrison’s book Animal Machines (1964, reprinted 2013) was definitely the pioneering publication which attacked the industrialisation of animal production. In chapter IV, Harrison gives a detailed description of battery cages for laying hens and resulting animal welfare problems. It was her book which stimulated the publication of the Brambell Report (1965). In this report it was stated that laying hens should have freedom to stand upright, rest, turn around, stretch their wings and eat and drink undisturbed. The EFSA-Report is an answer on a request of the EU Commission related to the welfare of laying hens in various systems of keeping laying hens (Question N. EFSA-Q-2003-092). The LayWel project of the European Union (SSPE-CT-2004-502315), which has to be seen in relation to Directive 1999/74/EC, had the general objective to produce a series of reports on the welfare of laying hens in various systems, with special focus on enriched cages. The Review of the Canadian National Farm Animal Care Council is the most detailed and comprehensive overview on research dealing with priority issues in keeping laying hens in various housing systems which is presently available. This review was compiled in preparation of an update of the “Code of Practice for the Care and Handling of Pullets, Layers, and Spent Fowl: Poultry (Layers)”. In the Brambell Report (1965, p. 16-19) the advantages and disadvantages of battery cages and the barn system (the report uses the term “loose housing”) were compared. “First, it must be noted that the degree of confinement to which the battery hen is subjected is extremely close and imposes strict limitation of the normal behaviour pattern of the bird. … Under such circumstances the birds cannot stretch their wings, moving without touching one another or stand fully upright at the rear of the cage…They cannot fly, scratch, perch or walk freely. Preening is difficult and dust-bathing impossible…The caged bird, which is permitted only to fulfil the instinctive urges to eat and drink, to sleep, to lay and communicate vocally with its fellows, would appear to be exposed to considerable frustration”. On the other hand, keeping laying hens in battery cages has some advantages according to the authors of the report. The birds are separated from their excreta which results in cleaner feathers and eggs and also reduces the risk of an infection, thus improving the health of the laying hens. Small groups of hens with a stable social order also reduce the vice of feather pecking and cannibalism. “They are free to exercise their legs and wings, to preen and they can occupy themselves by scratching in the litter in search of food and dust-bathing. However, the deep litter system has two major disadvantages”. According to the authors of the report, these disadvantages are the disease risk (coccidiosis) resulting from wet litter and the risk of feather pecking and cannibalism because weaker hens are not protected from their fellows. Here, beak treatment may be a means to reduce the risk, but this can reduce the welfare of hens considerably if not performed properly. The report mainly deals with the risks and disadvantages of the various housing systems regarding animal health and animal welfare as well as the contamination of eggs with zoonotic bacteria. “Housing systems for hens differ in the possibilities for hens to show species specific behaviours such as foraging, dust-bathing, perching and building or selecting a suitable nest. If hens cannot perform such high priority behaviours, this may result in significant frustration, or deprivation or injury, which is detrimental to their welfare. Injurious pecking is a serious problem in many systems and is especially difficult to control in large group furnished cages and in non-cage systems. The problem can be minimised by appropriate housing and management as well as genetic selection”. In conventional cages it is on the one hand the inability of the hens to perform some high priority behaviours and on the other the risk of bone fractures because of the low bone strength, especially during depopulation. In small furnished cages, the risk of feather pecking and cannibalism is especially high in non beak-trimmed flocks. Depending on the layout of the furnished cages, some high priority behaviours can either not be performed or are limited. For large furnished cages there were not data available on bone fractures, feather pecking and cannibalism at the time of completing the answer. In non-cage systems, feather pecking and cannibalism can be a serious threat in non beak-trimmed herds. In addition, there is additionally a high risk of parasitic diseases. The initial statement of the authors of the report (Deliverable 7.1) is that it is extremely difficult to draw a line between acceptable and unacceptable housing conditions. The judgements will vary between different people and groups of people. The placement of this dividing line will change as opinions of society change (p. 4). The main advantages and disadvantages are summarised for the housing systems which were evaluated during the project (p. 27 ff.). The main advantages of this housing system are the relatively low risk of disease and parasitism because of a better hygiene compared to other housing systems. This is a result of the separation of the birds from their faeces and the absence of litter. This also results in cleaner eggs, low levels of parasitism and bumble foot and reduced air pollution. The stable social hierarchy because of the small group size leads to a lower risk of feather pecking and cannibalism. The main disadvantages result from the limited space provided. This also reduces the ability of the hens to fly, flap their wings and exercise. The reduced mobility leads to osteoporosis and an increased risk of bone fractures during depopulation. The most important deficiency of this housing system from the perspective of the laying hen is in the opinion of the authors of the report the lack of an enclosed nesting area. Stress factors are also high because of an insufficient personal space and the lacking ability to escape from bullying fellow hens. The main advantages of this housing system are a better hygiene than in most non-cage systems which results in a comparatively low risk of infections with parasites or infectious agents. A lower use of preventive drugs including coccidiostats is the consequence. Mortality is generally low, especially in well-tested designs; it can, however, reach high values in non beak-trimmed genotypes. Compared to conventional cages, bone strength is much better because of the ability to exercise. The disadvantages of this housing system does not appear to be inherent to the system according to the authors of the report, but seem to depend on the specific design of the system, features, genotype of the birds and group size. Mortality may increase in brown genotypes with increasing group size if the birds are not beak-trimmed. The use of perches during the day for substantial amounts of time (40 – 50 %) may result in keel bone damage. At the time when the report was completed, there was not data available that enabled a comparison to the situation in conventional cages. In some designs, the dustbaths were not used frequently by the hens. Obviously, the layout of the scratching area and the offered substrate did not meet the needs of the hens. The main advantages of such housing systems are the greater opportunities for the laying hens to express the full behavioural repertoire. This is especially true for foraging in free-range systems. Bone strength of the hens increases because of their freedom to exercise, fly and flap their wings. The high use of nest boxes in such systems indicates the priority of the hens for an enclosed, discrete area for laying. The increased availability of space enables submissive hens to avoid contacts with aggressive birds. The main disadvantages of non-cage systems are the highly variable risks of feather pecking and cannibalism. This can lead to very high mortality rates, up to almost 37 %. Non-cage systems also show high percentages of bone fractures. They may result from collisions with perches, nest boxes and other structures. However, the reasons were not fully understood at the time when the report was completed. Subordinate laying hens may have restricted access to water and feed due to bullying of aggressive fellows. The disease risk increases considerably in litter-based systems and those with outdoor runs (internal parasites). It also increases due to contact with droppings and in free-range systems due to contact with wild birds. There is also a higher risk of predation in outdoor systems. Air pollution tends to be higher in litter-based systems; this can result in higher loads of infective agents and depress the immune system of the laying hens. In the introduction to the review, the authors declare that a welfare code should be based on the best available knowledge. Therefore, a scientific committee was installed to analyse the scientific literature available on key animal welfare issues and to develop a report synthesizing the results of research. The following documentation of the main results will concentrate on the conclusions for housing systems and their impacts on laying hen welfare (p. 16 and 31). Infectious diseases and internal as well external parasites can occur in all housing systems. The risk for these diseases to develop and disseminate are higher in free range and other non-cage systems in comparison to conventional and furnished cages. The risk of non-infectious diseases, such as fatty liver and osteoporosis are greater in conventional cages than in systems with more space and the ability of the hens to exercise. Mortality increases from furnished and conventional cages via indoor non-cage systems to free range systems. Foot problems differ in type and severity across housing systems. The risk of footpad dermatitis and bumblefoot are greater on litter floors, especially when they are wet, and with some perch designs. The risk of injury is significantly greater in non-cage systems compared to conventional and furnished cages; this is especially the case for broken or damaged keel bones. 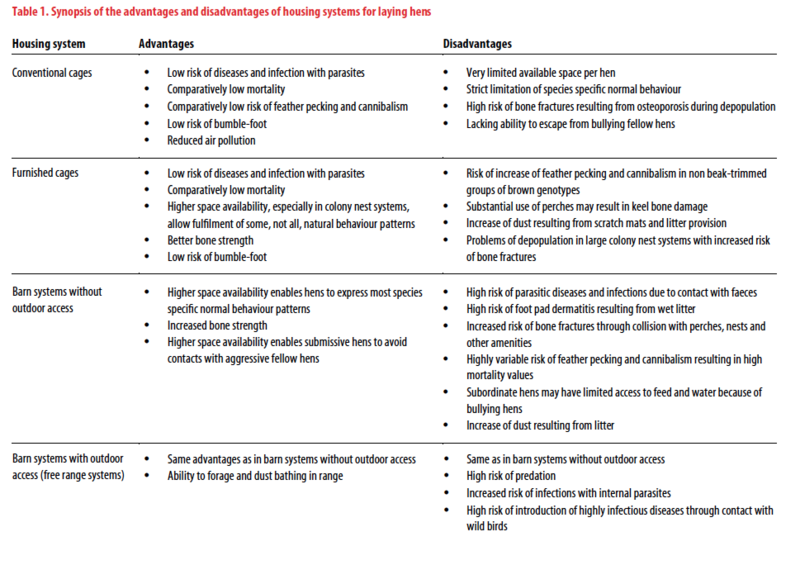 The risk of broken bones during depopulation of housing systems is greater in conventional and furnished cages compared to non-cage systems. Species specific normal behaviour patterns are nesting, foraging, perching, dust bathing, locomotion, and comfort behaviours such as stretching limbs and wing flapping. The ability to fulfil these behaviour patterns is significantly restrained in conventional cages due to the lack of space and amenities. In furnished cages, nesting, perching and comfort behaviour are well supported. Foraging and dust bathing seem not fully supported, however, by scratch mats due to their size and the offered litter. Cages furnished with nest areas, perches and scratch mats generally maintain the health and hygiene benefits of conventional cages while at the same time allowing the expression of some of the natural species specific behaviour patterns of laying hens. Mortality decreases with increasing space allowance in conventional cages. The greatest benefits are reached when the space per hen increases from 350 to 450 cm2. The space requirement for the expression of species specific behaviour exceeds the space required for standing. The required space for standing varies between 475 and 563 cm2 per hen. An increase in offered space per hen results in a greater expression of behavioural patterns. A cage height of 45 cm allows most behavioural patterns of light hybrid hens. A height of 55 cm may be necessary to permit wing flapping. There were no research results available on feeder and nest space requirements for hens in furnished cages and floor management systems at the time when the review was completed. A space between 12 and 15 cm per hen on linear perches seems to be sufficient but may not permit a roosting of all hens at the same time. There were no clear scientific data available at the time of the completion of the review with respect to flock sizes and stocking densities for non-cage systems. But it was assumed that system designs, distribution of the laying hens within a specific system and the environmental conditions within a system had a greater effect on bird welfare than group size and stocking density. Feather pecking and cannibalism can occur in all housing systems. The risk of these behavioural problems increases with group size, at least up to around 200 hens. The risk can be reduced by a variety of strategies that reach from genetic selection via offering attractive, friable litter to encouraging foraging and intensive use of the range in systems with outdoor access. A comparison of the results regarding laying hen welfare in various housing systems is presented in Table 1. The synopsis shows that all systems have advantages and disadvantages. The main argument to ban conventional cages and to implement alternative housing systems, either furnished cages, aviaries or free range systems, is the narrow confinement with very limited space per hen that does not permit the fulfilment of basic species specific behavioural patterns. This is at least true for the member countries of the European Union, the USA and Canada, as well as New Zealand and Australia. One has, however, to be aware of the fact that the attitude regarding the handling of livestock and poultry differs considerably between countries. The ethics of animal treatment and animal welfare which have developed in Europe or the USA over the past decades cannot simply be transferred to other parts of the world with a completely different cultural background and philosophical system of ethics. In this final part, a statistical overview will be given on the share of the various housing systems in laying hen husbandry in the EU and on a global scale. The EU (29) is the only contiguous economic region worldwide in which conventional cages are banned. 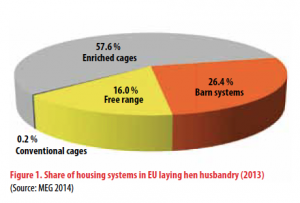 The EU directive 1999/74/EU initiated a transformation of housing systems for laying hens in the member countries. The transformation process was officially completed on December 31st, 2012. 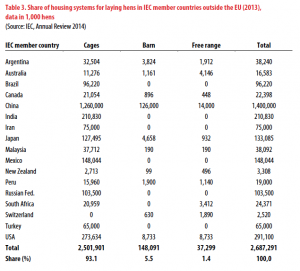 In Table 2 and Figure 1, the share of the various housing systems in 2013 is documented. 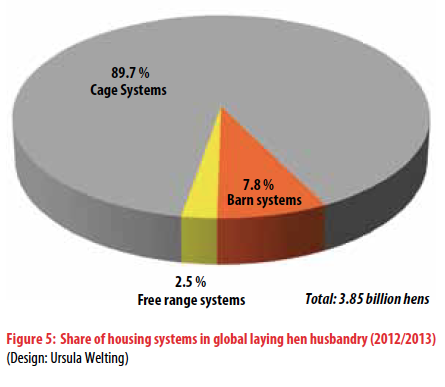 Of the 380.5 million laying hens, 57.6 % were kept in enriched cages, this includes colony nest systems, 26.4 % in barn systems and 16.0 % in free range or outdoor systems. 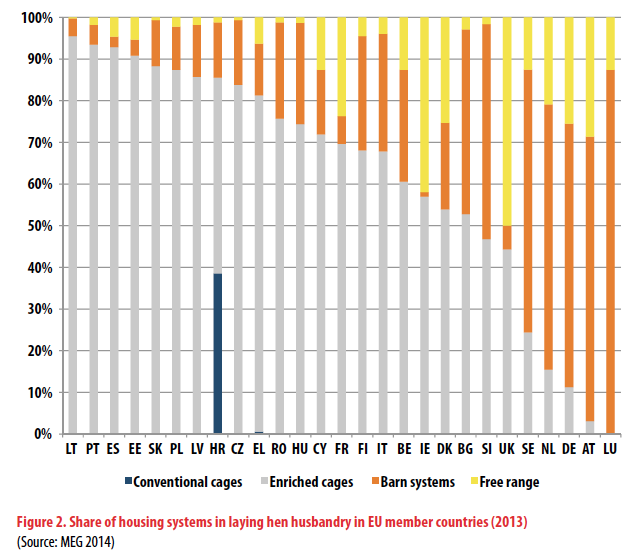 Figure 2 shows that the highest percentage of enriched cages was to be found in Lithuania (95.5 %), Portugal (93.5 %), Spain (92.9 %) and Estonia (90.8 %). 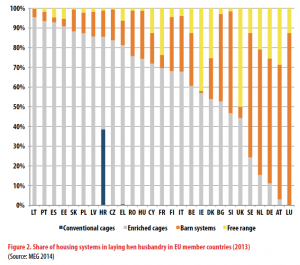 Barn systems were the dominating housing system in Luxembourg (87.5 %), Austria (68.3 %), the Netherlands (63.6 %), Germany (63.2 %) and Sweden (63.1 %). Free range systems reached the highest values in the United Kingdom with 50.0 %, followed by Ireland (41.9 %), Austria (28.6 %) and Germany (25.5 %). Conventional cages were still used in Croatia (38.6 %) and Greece (0.6 %). 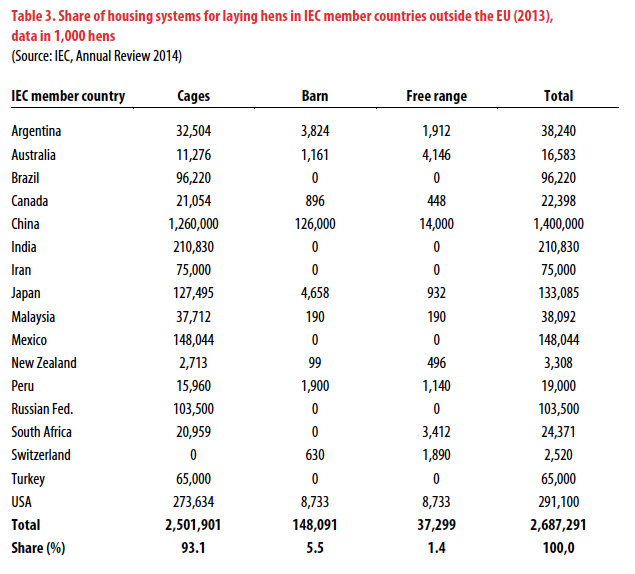 Besides the detailed data set for the EU, the share of the various housing systems is also available for a number of IEC member countries outside the EU. They were published in the Annual Review 2014 and were supplied by the IEC rapporteurs from the single countries. 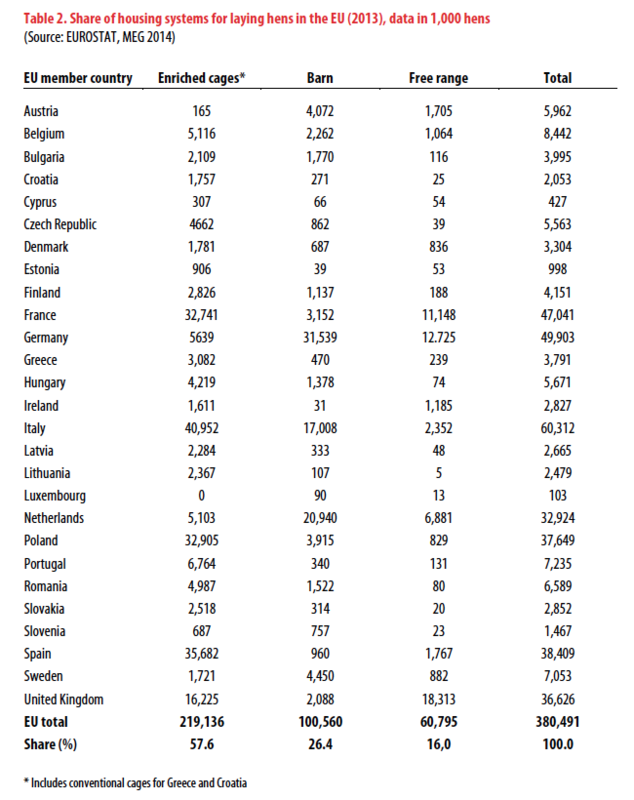 A comparison of the data in Table 3 with those in Table 2 reveals that the share of cages is much higher in the non-EU countries. Over 93 % of the 2.7 billion layers in these countries were still kept in cages, mainly in conventional cages. 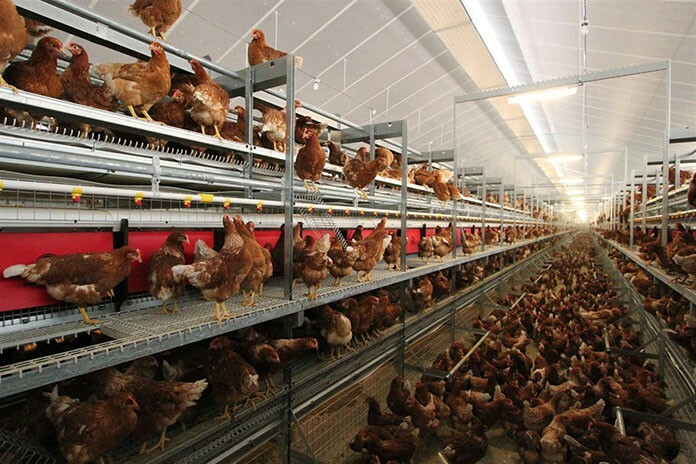 In some countries, enrichable cages according to the EU directive have been installed in recent years, but they do not necessarily provide the space per hen as required by the EU directive. The only country without any cages is Switzerland where this housing system was banned in 1992. Cage-only housing of layer hens reported Brazil, India, Iran, Mexico, Russia and Turkey. This is, however, only the case in market-oriented egg production. Data on the number of birds kept in small flocks either for on farm egg consumption or sale in nearby communities in these countries is not available. 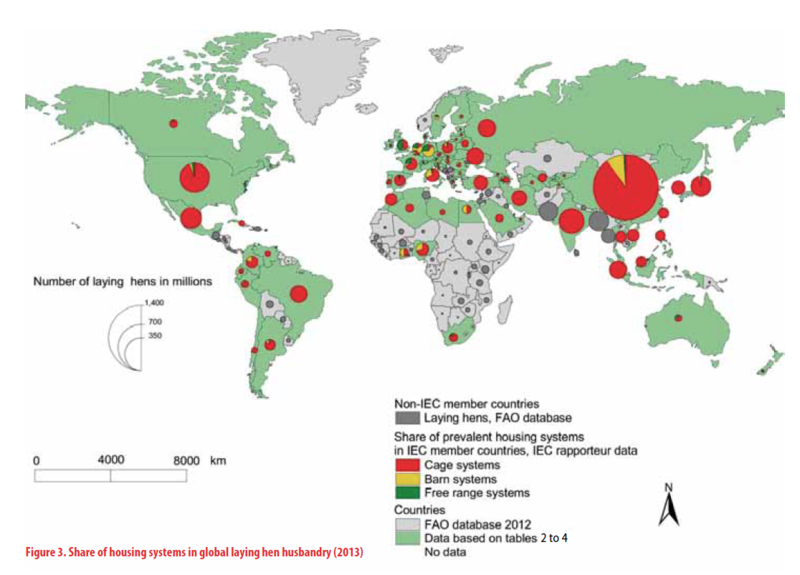 In 2013, about 56 % of the global laying hen population was kept in the countries listed in Tables 3 and 4. Of the 3.1 billion birds, 2.8 billion or 90 % were still kept in cages, most of them in conventional cages, 8 % in barn systems and only 2 % in free range systems. 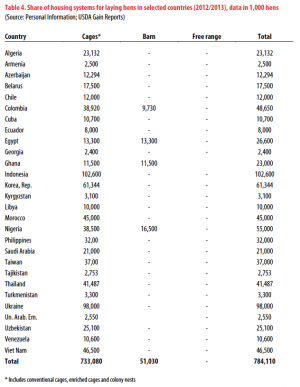 In Table 4, countries are listed for which the author received information from various persons. The reliability of the data for some of the countries is definitely lower than for the countries listed in Tables 3 and 4. This is mainly due to the fact is almost impossible to decide what percentage of the laying hens is kept in commercial farms respectively backyard flocks. For most of the sub-Saharan countries in Africa and a number of Asian countries no estimates are given even though one can assume that most of the hens in commercial farms are kept in conventional cages. 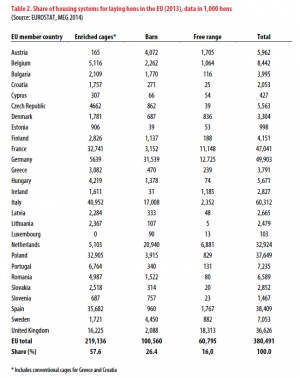 The share of the various housing systems in the countries listed in Tables 2, 3 and 4 is shown in Figures 3 and 4. For all other countries, they contribute about 30 % to the global laying hen population, but no reliable data is available. 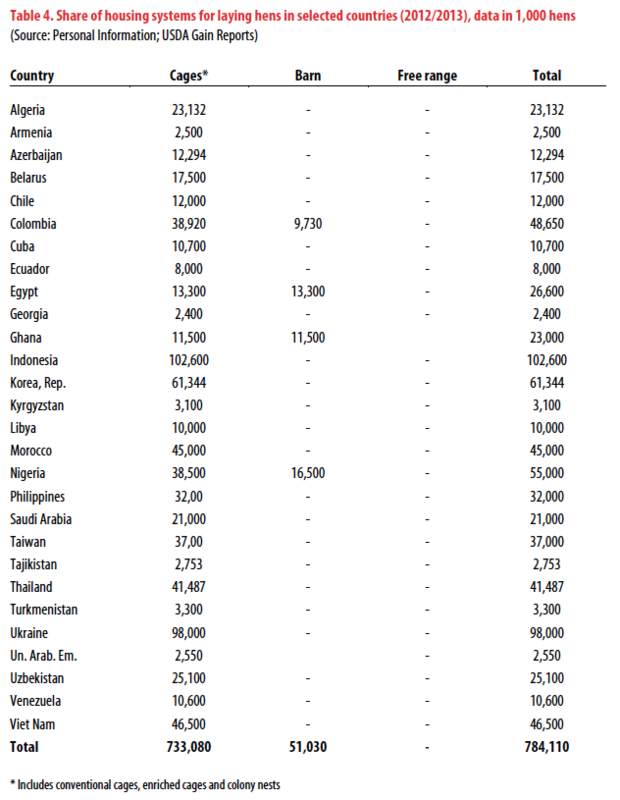 For these countries, only the absolute number of birds as published by the FAO is shown in Figure 3. This leads to the final result that presently 3.5 billion laying hens or 89.7 % of the 3.85 billion laying hens for which data on housings systems are available are still kept in conventional cages, enriched cages and colony nest systems, 7.8 % in various barn systems and 2.5 % in free range systems (Figure 5). The preceding analysis could show that despite the situation in the EU, where conventional cages were banned in 2012, and the ongoing discussion about the future of housing systems in Canada, the USA, Australia and New Zealand, the vast majority of laying hens is still kept in conventional cages. This is especially the case in almost all threshold and developing countries and in the Russian Federation and former GUS countries. In these countries, a change to alternative housing systems will not happen within the next one or two decades because of the lack of the financial means necessary to install either enriched cages, colony nests or barn resp. free range systems, and the lacking know how of egg farmers to use alternative systems. In some countries of the wet and semi-arid inner tropics, alternative systems, in particular barn systems with winter gardens and outdoor access and free range systems may not be recommendable because of the climatic situation and the high risk of the introduction and dissemination of highly infectious diseases. If the animal welfare discussion which was the main driving force behind the changes in housing systems in the EU and is presently also gaining in importance in Australia, New Zealand and Anglo America, will spread to Japan and other countries in Asia, Africa and Latin America, is still an open question. Initiatives by the FAO, private companies or the IEC in Southern and Eastern Africa or Southern Asia to improve the knowledge of small egg farmers and to introduce more intensive production systems are in favour of alternative housing systems. But large market-oriented units will also in future stick to conventional cage systems because of the economic advantages and the lower disease risk. In most developing and threshold countries, the animal welfare discussion has not even started. It will not be easy to change the housing systems because food security has the absolute priority. The example of the EU shows impressively that only when food security is no longer a problem, animal welfare aspects can gain in importance (c. f. Grandin 2014, Wolf 2012) and initiate a change in the attitudes of the society towards keeping animals. It is obvious that the California Proposition 2 which was passed in 2008 by a majority of 63 % of the voters in favour, goes back to the Brambell report, for it requires “that calves raised for veal, egg-laying hens and pregnant pigs be confined only in ways that allow these animals to lie down, stand up, fully extend their limbs and turn around freely”. This statement is contradictory to the later listing of the main threats to bird welfare where the report says that not data are available on feather pecking and cannibalism in large furnished cages. The key issues which the report deals with are: rearing methods, housing systems, space allowance and group sizes, bone health, feather pecking and cannibalism, beak treatment. The total number of laying hens kept in market-oriented egg farms is estimated at 5.5 billion birds. The number is considerably lower than the FAO estimate of 6.78 billion hens. This is mainly due to the reduction of the number of hens kept in China by 1.2 billion. The FAO figure for this country (2.26 billion) is far too high according to information from the Chinese rapporteur. He estimates that only 1.4 billion hens are kept in market-oriented egg farms.